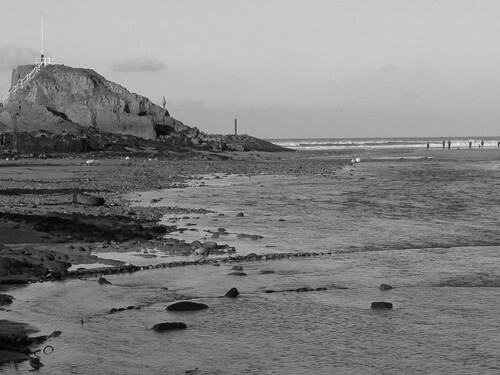 And sound – the wind hammering in ears, the sea thundering and crashing, the snatched cry of seagulls. Now we have music – a climactic moment in a symphony without a beginning or an end, composed by Nature and performed by The Elements. But how to describe it for those who sail in small boats. There is probably a scientific explanation, with each molecule of water predicted to a particular position with regard to every other molecule and the surrounding conditions. Perhaps there is, but it is far too confusing, too complex for we mere mortals, so we rely on words. And finding words is an art. These days, we might try “Awesome“, but it is short-hand and doesn’t really express a storm properly. Some have described storms with first-hand reportage . . . Some with extreme drama . . .
“Poor naked wretches, where so’er are you / That hide the pelting of this pitiless storm.” William Shakespeare (King Lear). Some with more rhythm . . .
“And large blue seas each other chased, / Cascading over down the waist. / At every pitch he held his breath; / As if he saw the face of death. / “She’s pitched away a topmast, smash!” / All hands to clear away the wreck, / Were in an instant turned on deck; / From hammock starting out alert, / Up flew each seaman in his shirt! / And up the straining shrouds they swarm, / Growling and swearing at the storm. / The wreck secured or cut away, / She snug beneath a trysail lay.” Capt J. Mitford RN, from Adventures of Johnny Newsome. Of course, there are always those who see it in an entirely different way . . .
And if poetry doesn’t work for you, then Adlard Coles’ “Heavy Weather Sailing” , now in its 30th edition, is the definitive work. With acknowledgement to John Irving for the poetry, quoted by him in a Yachtsman’s Week-end Book, 1938. 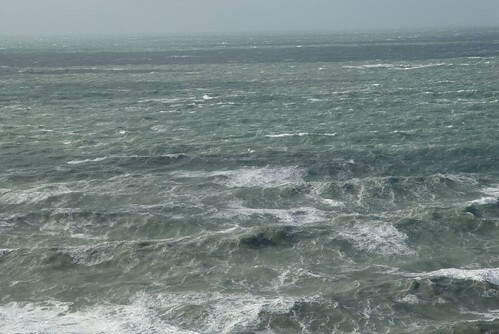 The wind increases, the foam begins to streak, the Atlantic swell presses home. 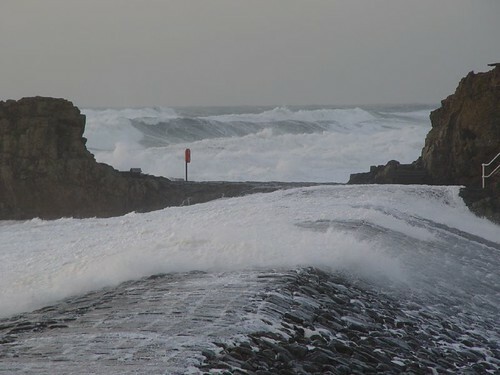 The images were taken in March and it’s not the “snowing gale” mentioned below but a fresh south easterly, blowing off this west-facing shore, the southern edge of a high pressure area, a low somewhere to the south, the wind funnelling between the two. But how to describe weather? Beaufort’s original description of Force 7 is one way – (and the accepted one when first introduced – and now modified), but the poets can be more vivid. 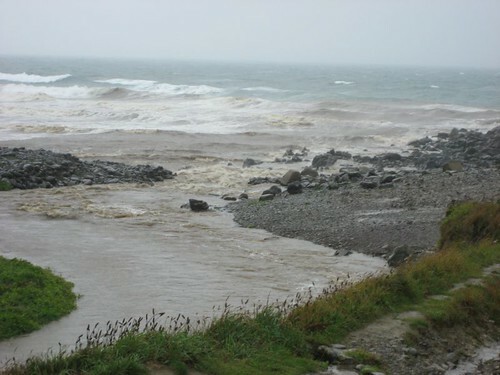 For example, Stevenson’s few words on a gale bring life to the scene. I particularly like the “flash of sun” and “the passion of the gale”. The boats are on the sea and the crews are on the pier. A flash of sun is on the veering of the vane. 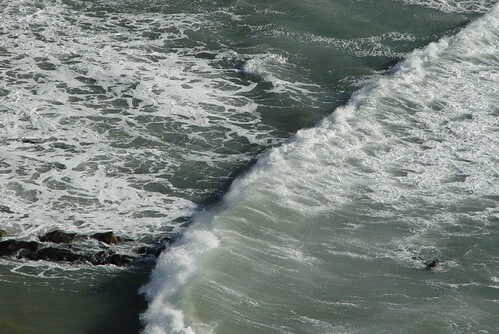 Previous posts on this – waves, waves (cont), a question of scale. The previous afternoon the weather was similar. . .
a light swell is coming off the Atlantic. Waves are in motion, just visible, moving towards us across the surface of the water – at speed. The actual water they pass through is barely changing position, describing small, slow, circular, vertical orbits. Finally, almost at the last moment, a small section of a wave is cut off by the rocks- guided into a gully. Forced into the tight space, it loses speed as it drags against the sides. But it retains its energy. Thus gaining height, it trips over itself, breaking on some underwater obstruction. And now it is the water itself – (at a ton per cubic metre), that is surfing down the face of the wave, accelerating towards us. 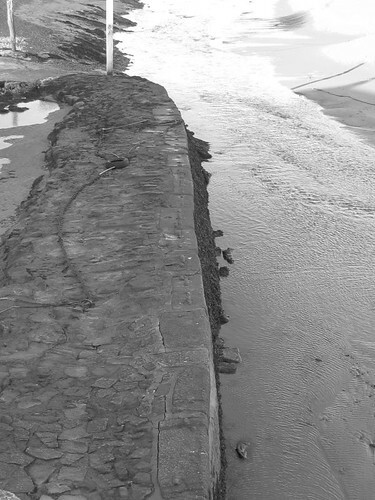 In speeding up, it quickly reaches its end, dashing itself with abandon on the Breakwater – while, a few seconds later, the rest of the wave, still in the freedom of comparatively open water only a few feet away, rolls sedately up the stones. 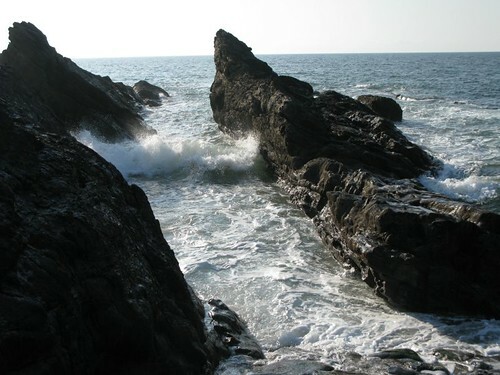 And here, it is lifted by the swell above the surrounding sea, only to sluice downhill across the rocks, seeking balance with the main body of water. As I write, I can hear the wind hammering the trees in front of the house. 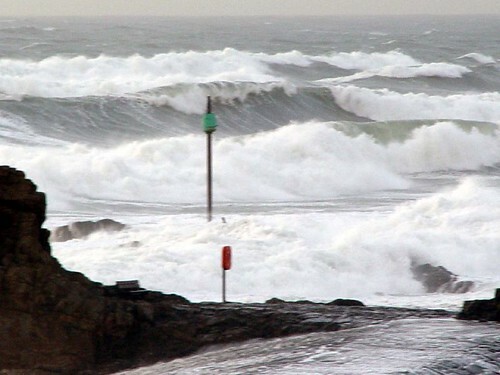 The inshore waters forecast for here gives southwesterly 6 to gale 8. Visibility: Moderate or good, occasionally poor in west. 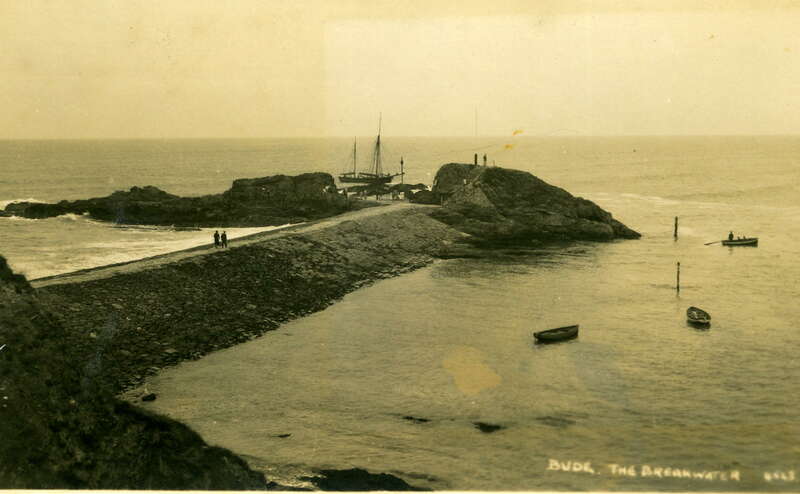 I mention this because 73 years ago today, off Baggy Point on the north coast of Devon at the western end of the Bristol Channel, on a quieter, fog-ridden day, the Ceres foundered. The report in the Bideford Weekly Gazette on 1st December 1936 is recorded below. The following year, my grandfather commissioned Pelham Jones to commemorate her on canvas (above). 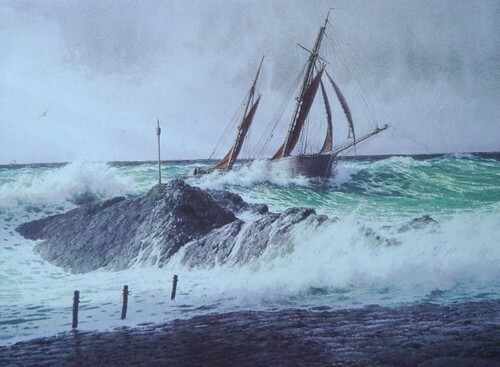 The painting is a wonderfully optimistic depiction of a coasting ketch, albeit with her competition lurking in the background. It is a painting for her owner to enjoy. I find John Chancellor’s painting of the Ceres to be equally optimistic. I suspect he painted her purely because he enjoyed painting ships and boats. This is a painting for the artist himself to enjoy. Taken from an article in the Bideford Weekly Gazette dated December 1st.1936. 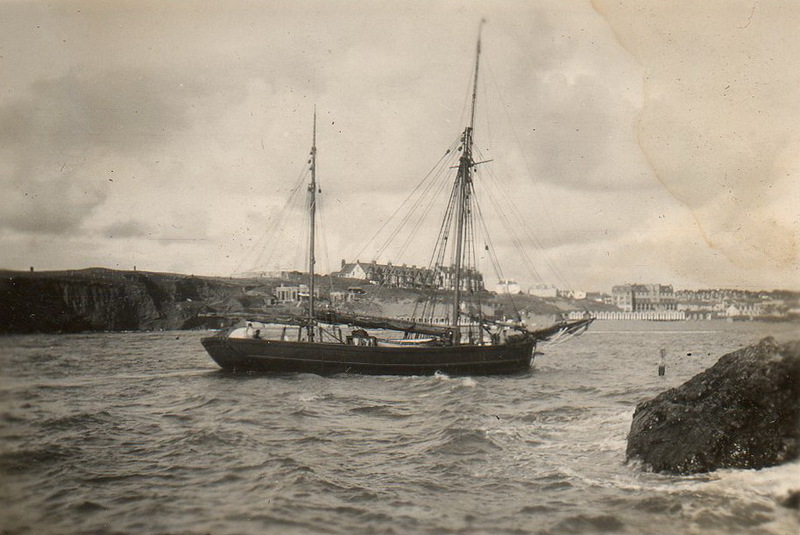 The 125 years old “Ceres”, veteran of the merchant service, her course now run, lies at the bottom of Bideford Bay, somewhere off Baggy Point. 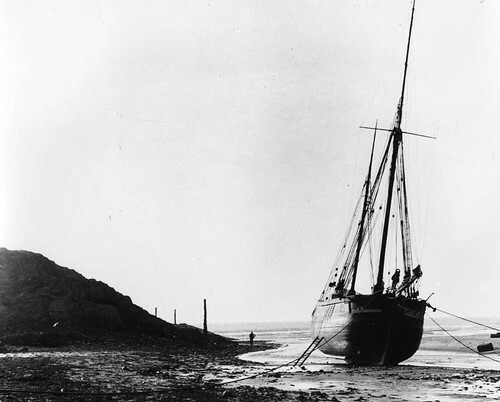 The “Ceres” sprang a leak on Tuesday night while on a voyage from South Wales to Bude, and foundered after her crew had put off in her boat and had been picked up by the Appledore lifeboat. The Captain is Mr Oswald Jeffery, a married man, whose home is in Richmond Road, Appledore, and the mate Mr Walter Ford, a married man of Irsha Street,, Appledore. 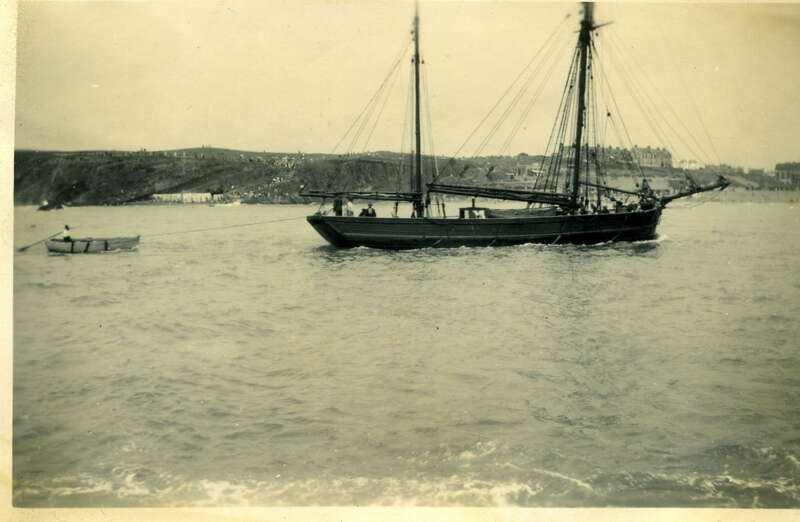 They reached Appledore in the lifeboat at about 11 o’clock, and on arrival the Rev Muller offered a short prayer of thanksgiving for their safety. 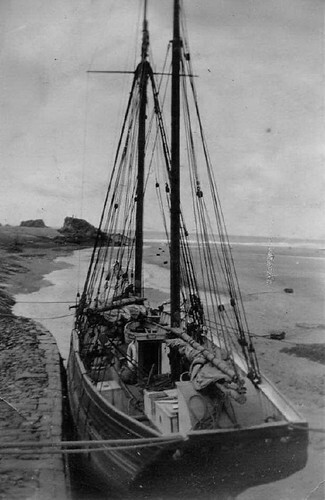 Captain Jeffery said,” We left Swansea on Tuesday bound for Bude with a cargo of slag. 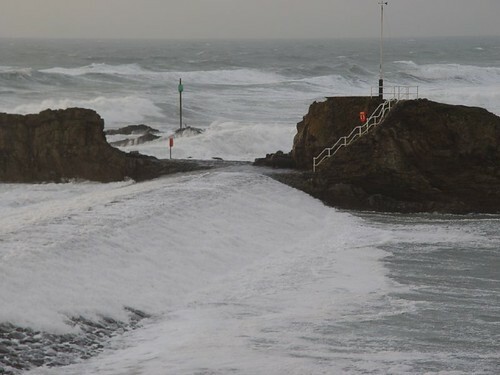 Because of the weather we intended to go in over the Bar for the night as it was to rough to venture on to Bude. At 8 o’clock I went below to rest for an hour, leaving the mate in charge. An hour later he told me there was water in the engine room. We manned the pumps. We tried to get the ship over the Bar, but the water made her roll badly, and I gave the order for the ship’s rowing boat to be launched. I fired two rockets, and we abandoned the vessel. We lay in the shelter of the “Ceres” which was sinking, and were taken onboard the lifeboat. Dr. Valentine stood by in case medical assistance was needed, but although wet through, neither the captain nor his mate appeared any the worse for this ordeal. 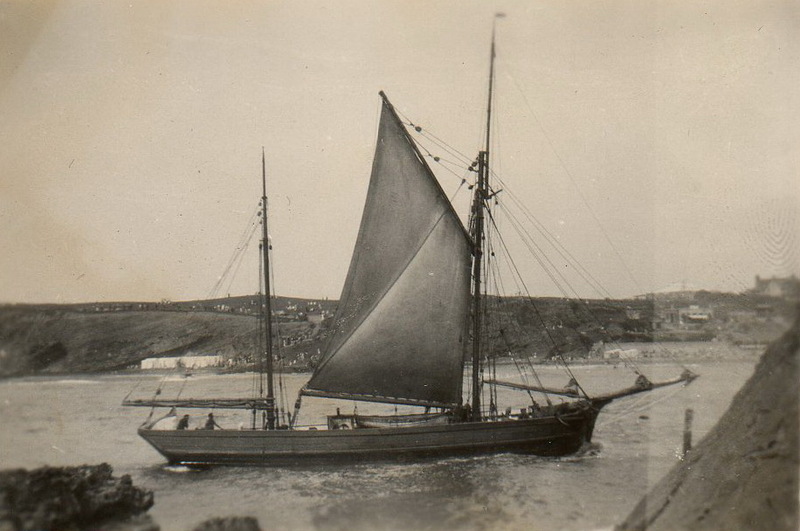 The “Ceres” was owed by a Bude firm of coal merchants, and was built in Salcombe. 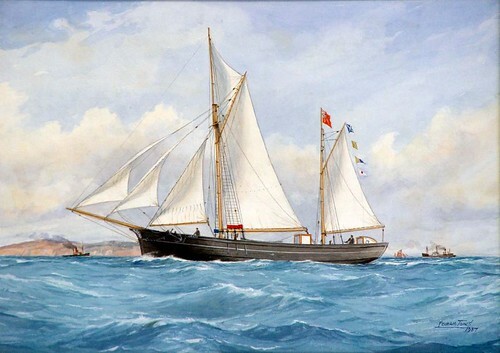 Ketch Ceres 1811 – 1936. Built in Salcombe, Devon in 1811.She carried stores as a revitaling ship at the blockade of Brest during the Napoleonic wars. 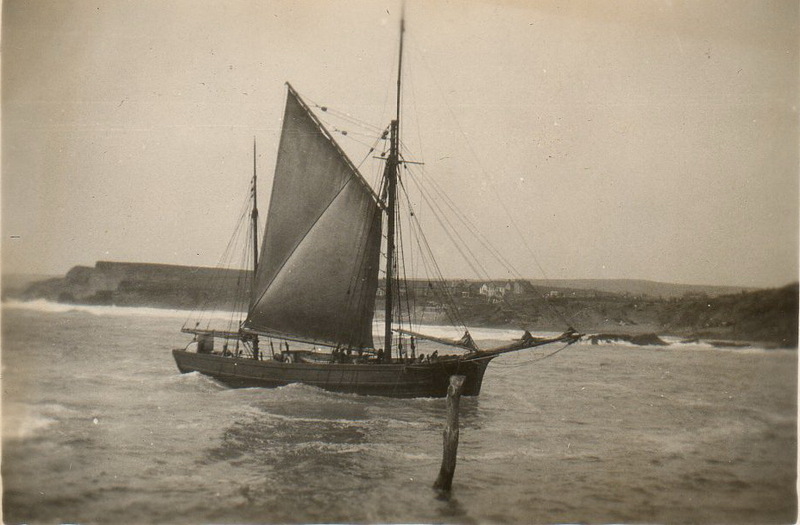 Was the oldest sea-going vessel afloat until she sank in Croyde Bay one November evening in 1936. 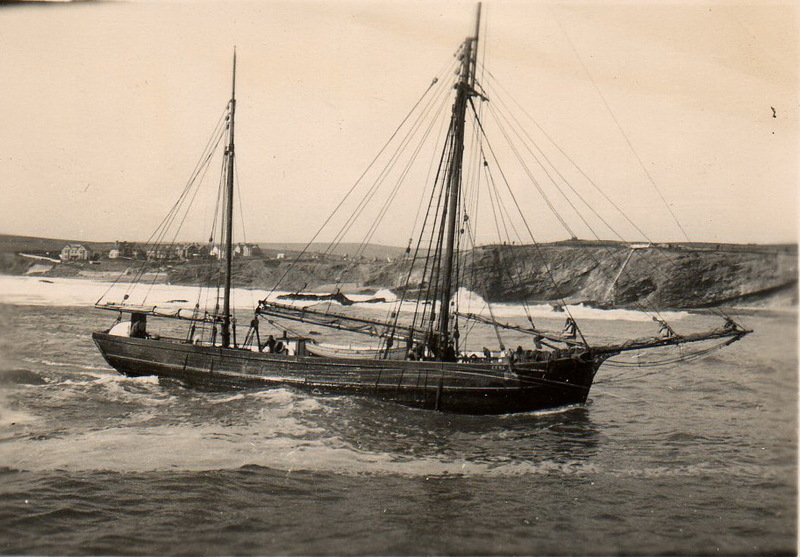 My late father Walter Ford always maintained that she sank because the vessel had recently had a new timber set in, and this had swollen and had displaced the much older timbers which surrounded it. For further posts on the Ceres here. It has been proved that the weather is unpredictable in the short term. One more reason for Britain lying directly below a jet stream delivering storms from the Atlantic. (If only Fitzroy knew that 🙂 )We can only establish some long term (seasonal) trends. 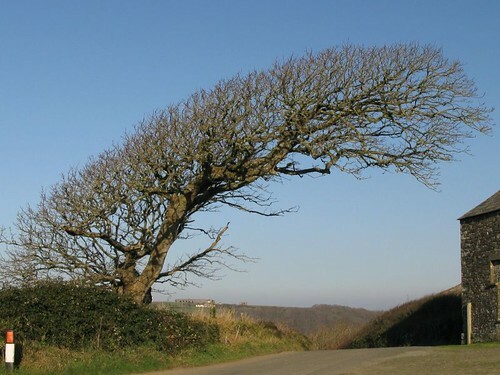 For example, in Greece it is known that “The ‘weather’ always comes from the West” whereas over here (UK) the direction is SW….There is evidence for this on the way that older trees are bent. Wind Westerly or northwesterly becoming cyclonic, 5 to 7, decreasing 4 in north. 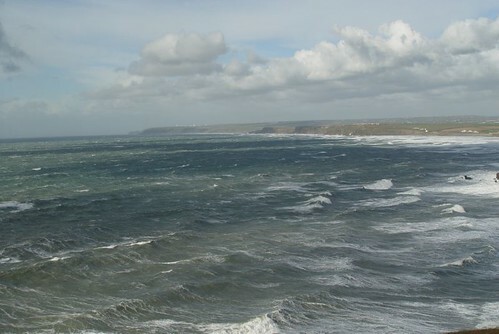 Sea state Moderate or rough, but slight in east. This is this evening’s inshore waters forecast. It was right for the whole day. 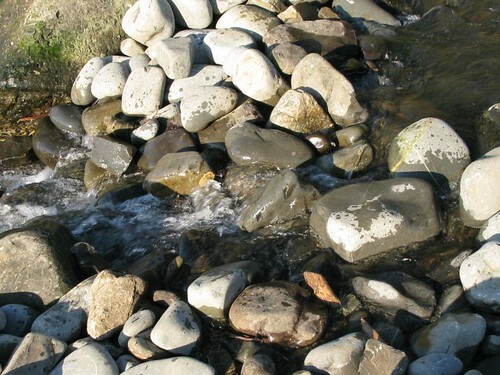 The heavy rain has swollen the river and once again altered the shape of the pebble ridge, the same ridge that presented such a peaceful scene last December. This is the weather that makes this coast exciting and invigorating. The only problem is that this is July. Why can’t it wait until the Autumn? I was climbing the path to Steeple Point. Towards the top, the land falls steeply away, rapidly becoming a cliff face that drops vertically to the rocks below. 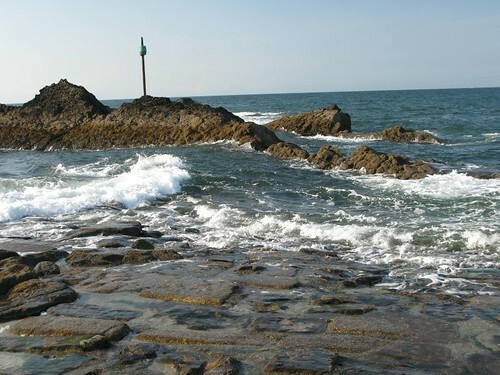 With the tide in, these rocks are covered by sea – Atlantic rollers reaching their nemesis on the Cornish coast. 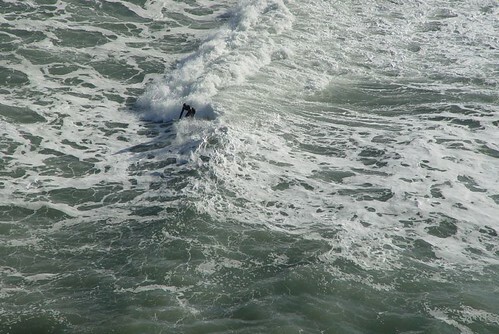 From up here, you watch those big swells roll in. 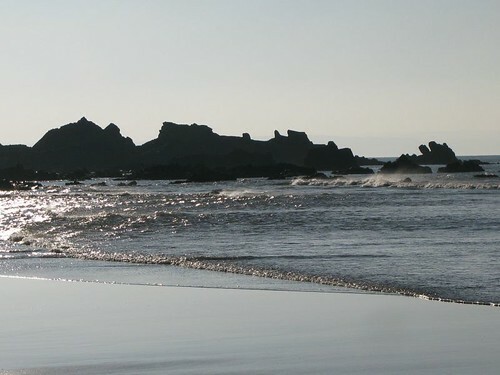 They build, curl and crash forward in a welter of foam, sparkling in the sunshine. Piling over the back-tow of their predecessors, they waste themselves on the pebble ridge. 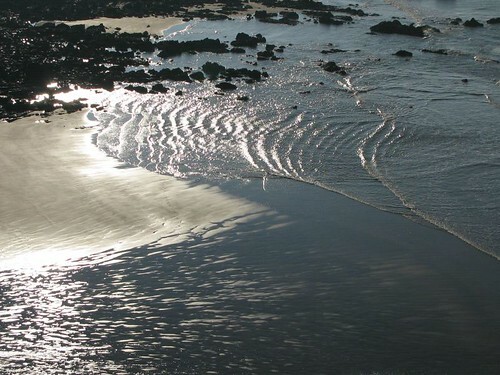 There are intricate patterns of foam, constantly changing, highlighting myriad currents and cross-currents. That morning, there was nobody in sight. I was enjoying the aloneness. . . the warmth of the sun . . . the smell of salt in the air. 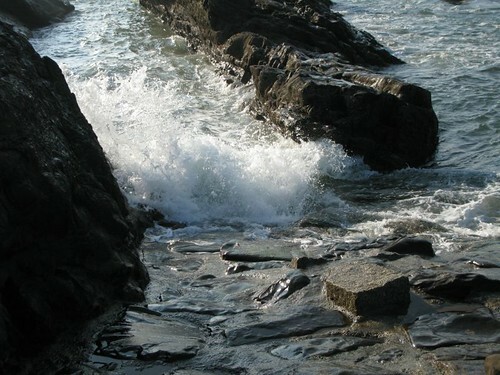 . . the sound of waves on rocks. There was a slight breeze, I remember. And then this guy appears below me on a surf board. The waves were sweeping in from around the Point. He had been hidden out there as I climbed. So, it wasn’t my sole world after all. There were two of us – the one holding a camera and idly watching, the other intently doing. It was so totally unexpected. I felt a little shocked – a bit put-out. Then I felt admiration – what a great ride in such a beautiful place. And then a change of mood – sudden concern because of what I could see from my vantage point. A moment of doubt burst into this memorable day. The concern was all mine, of course. Whatever I saw, whatever I thought might happen, was way beyond my control. He didn’t care. He knew what he was doing. He was having a ball. I could only watch, my concern pointless. Let him get on with it. He paddled out to catch another wave. I continued my walk. Two separate lives enjoying the same space, viewing it through different eyes. 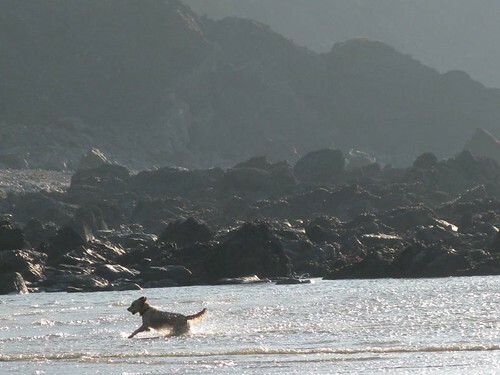 On Boxing Day, at low tide, we walked on the beach. The weather was one of blue skies and crystal-clear visibility. The views were amazing, but there is always more to a view than meets the eye – there is a history that rides with it. This is not a request to focus on the past, but to share it – to acknowledge that the past existed and that those who lived through it were no different from us. They too saw the world change before their eyes and their old certainties lost to an unknown future. Thus the toast this Christmas is the toast of Christmas’ past – “Absent Friends”. Here are four images taken yesterday morning at Duckpool on the coast of North Cornwall. 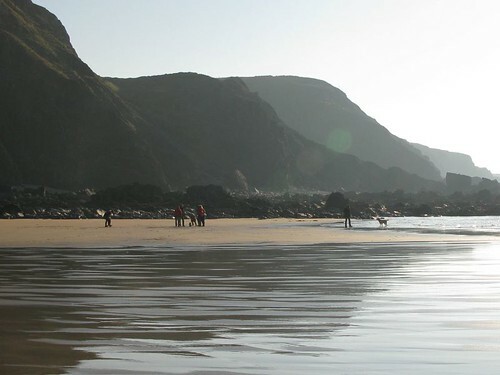 A combination of low tide, bright sunshine, and a cold, easterly, offshore wind. 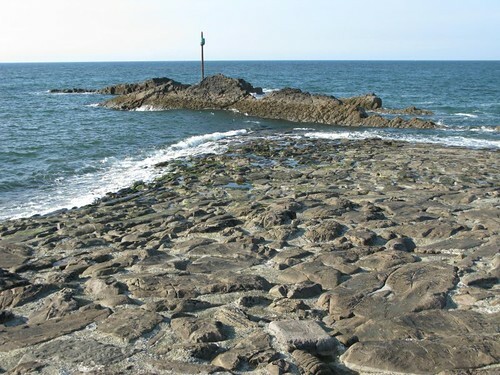 This is a wreckers’ coastline – to be avoided on a lee shore. Yesterday it was a place to take the air after Christmas.